David Allen "Dave" Roberts is a Georgia employment non-compete attorney who practices exclusively in the areas of Georgia non-compete law, trade secret litigation, employment contract and severance agreement drafting and litigation, sexual harassment, discrimination and retaliation cases, wage and hour disputes and business contract litigation. Mr. Roberts is a Partner with the Atlanta firm of Hall, Arbery, Gilligan, Roberts & Shanlever LLP which was recently recognized by "Super Lawyers" as the most outstanding (2-10 attorney) employment law firm in the State of Georgia. Mr. Roberts devotes a very large percentage of his practice to the representation of clients in the legal evaluation, litigation, drafting and negotiation of Georgia non-compete agreements and other restrictive covenants. Georgia non-compete law has recently and dramatically changed and can be very technical and complex. Mr. Roberts has significant experience in this area and has been very successful assisting clients maneuver the litany of nuance associated with Georgia non-compete law – both under Georgia’s “old” non-compete common law and the recently enacted Restrictive Covenant Act which controls Georgia non-compete agreements entered into on or after May 11, 2011. Georgia employment non-compete lawyer Dave Roberts has nearly 18 years of experience in the area of Georgia non-compete agreements and other restrictive covenants. In addition to his Georgia non-compete law practice, Mr. Roberts frequently represents clients in the Southeast and nationally in non-compete and other restrictive covenant matters. This website contains a full description of Mr. Roberts' Georgia non-compete law practice in addition to helpful information on some of the basics of Georgia non-compete law. Click here to learn more about Georgia non-compete law in the linked Non-Compete Q&A. Atlanta employment attorney Dave Roberts also assists clients in cases pertaining to the threatened or actual misappropriation or use of confidential or trade secret information. These cases arise frequently in circumstances where an employee has left an employer to work for a competitor and also in connection with disputes over Georgia non-compete law agreements and other restrictive covenant disputes. Mr. Roberts has significant experience representing clients in the litigation and resolution of Georgia trade secret and confidential information cases. Atlanta employment contract and severance agreement attorney Dave Roberts' practice also includes the representation of clients in a wide variety of employment contract matters including the drafting, negotiation and litigations of Georgia employment contract issues and Georgia severance agreement matters. In addition to his extensive work in the areas of Georgia non-compete law and other Georgia employment contract, severance agreement and trade secret matters, Mr. Roberts has an extensive background in representing clients in a wide variety of sexual harassment, discrimination and retaliation cases. Mr. Roberts has been very successful in securing favorable resolutions of employment cases in the areas of sexual harassment, discrimination and retaliation. Mr. Roberts also represents clients in a broad range of other employment-related matters involving federal and state employment laws including wage and hour matters, employment-related torts and Georgia workplace violence issues. In addition to its Georgia non-compete agreement and employment law practice, Atlanta business litigation attorney Dave Roberts also frequently represents clients in a wide variety of business litigation matters including contractual disputes between businesses. Because of his diverse legal background and experience, Mr. Roberts also serves as outside General Counsel to several companies and organizations. Dave Roberts has a diverse legal background in the areas of Georgia non-compete law, employment, business and trial law having served as a prosecutor and as a trial attorney in three of the Nation's largest and most prestigious law firms and more recently joining and becoming a named-partner in the well-respected Atlanta employment law Firm of Hall, Arbery, Gilligan, Roberts & Shanlever, LLP. Georgia employment non-compete attorney David Allen Roberts and Hall, Arbery, Gilligan, Roberts & Shanlever, LLP provide "big firm" service to clients without the exorbitant legal fees that often result in resolving Georgia non-compete law cases and other employment and business litigation matters. Click here for a full attorney biography. Click here for testimonials from clients that Mr. Roberts has represented. 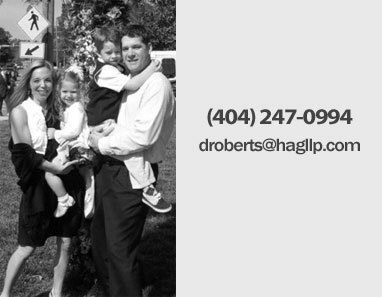 We invite you to tour this website and contact Atlanta non-compete agreement attorney David Allen Roberts with any questions at 404-247-0994 or droberts@hagllp.com.